This week Chunk was asked to test out some toys from online retailer Wicked Uncle. This toy company's main customers are uncles, aunts and grandparents (hence the name) for birthday and Christmas gifts, so to help these family members they've arranged their site in a very clever way. The toys are divided into age and gender categories which is really helpful for some people in my extended family who have never had children of their own and struggle to work out what toys are relevant for each age and developmental stage. I got to pick out the two toys and enjoyed knowing I was only looking at toys relevant for his age and it made things much quicker as I wasn't having to read about things that were too young or old for him. My only slight reservation was that due to it also being categorised by gender there may have been some toys I didn't see that he may have liked- or example he quite enjoys the film Frozen and he does have a buggy and doll because I'm a fond believer in trying to avoid gender stereotyping where I can. But all I have to do is simply search the female age category so it's not an issue! 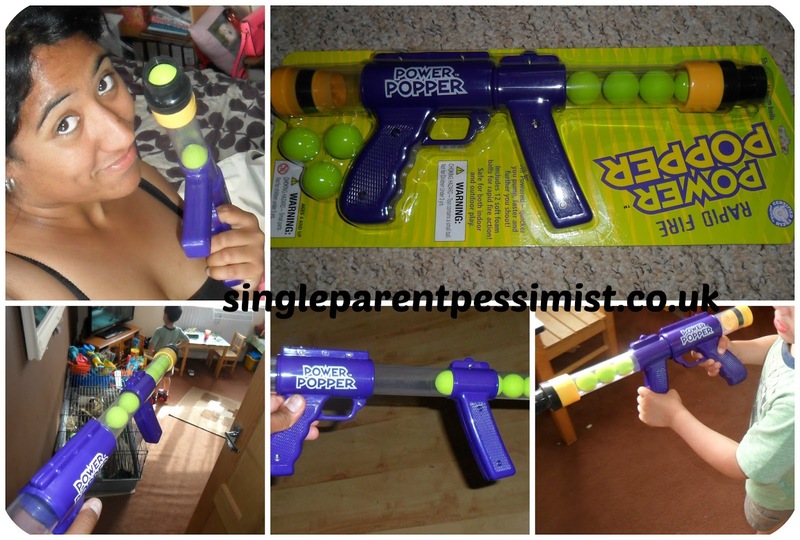 This basically shoots soft foam balls by using a hand-pump action and it's soooo fun! Chunk has played with Nerf guns at his grandfather's house but when those things are aimed at you they really hurt so I was pleased to find a similar product that shoots much softer balls that don't hurt when they get you. Most of the time it has been me shooting it (like the big kid I am) as he has loved seeing if I can get parts of his body like his knees, bottom and arms. He has then looked for all the little foam balls and counted them as he has reloaded it so we have been able to keep up with the number practice whilst having fun. No batteries are needed as it's air powered and I was surprised at how far it could shoot and how fast I could shoot three or four in succession! It can be used inside or outside and I can see it being quite a fun thing to do during a rainy day stuck indoors. This clips onto any scooter or bike handlebars and contains 25 sounds such as horns, motorbikes and even a lion's roar, and it also has white and green lights. The lights can flash or stay on constant and the sounds thankfully have three volume settings. It clips on easily (thankfully) and if it's used on a bike it has a remote trigger to avoid having to keep letting go of the device to make a sound. It's also waterproof so I don't have to panic if it suddenly starts raining whilst we're at the park. Chunk loves the police siren noise the most as he attaches it to his Spiderman scooter and pretends he is responding to a superhero emergency! I like that it has a large range of sounds so I don't end up getting sick of it after he's been playing with it for ten minutes, and my sanity can remain intact! Chunk was provided with two toys to test for the purpose of this review. All opinions are honest and my own and no payment was received.